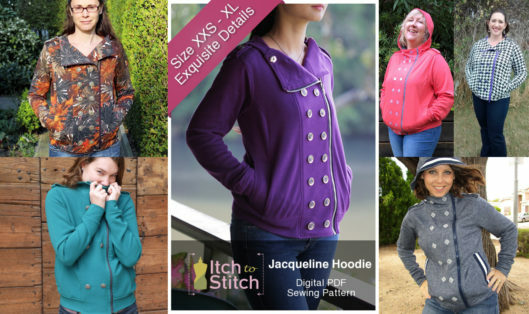 Jacqueline Hoodie PDF sewing pattern is officially available today! I have to be honest with you, I love mine so so so much. In the evenings when the temperature drops and the wind blows a bit harder, I reach out to my Jacqueline Hoodie. It’s now my favorite way to stay warm and stylish. Jacqueline Hoodie is modeled after a hoodie from a high-end ready-to-wear brand. And you can see all the exquisite details – the buttons, epaulets, double topstitching, in-seam welt pocket – give it a very polish and chic look. One thing you might want to know is that Jacqueline Hoodie fits full-figured ladies very well. That is because I drafted the largest size using a DD cup, while using a B cup to draft the smallest size (and blend the cup sizes in between). In fact, this is the way I drafted other Itch To Stitch patterns (except Marbella Dress, which explicitly provides multiple cup sizes). Here’s a run down of Jacqueline Hoodie. Take a look at the product page to find out the size range and material requirements. Without further ado, here are some of their wonderful Jacqueline Hoodies. Angela’s beautiful Jacqueline Hoodie from a colorful, patterned fabric for a full impact. Debbie’s Jacqueline Hoodie makes me happy. What a wonderful color on a beautiful cheerful lady! Diane sent me many photos of her chic hoodie, but I love this one. She looks like she is having so much fun. Also, check out her interesting trims! Jordan used a houndstooth fabric with a bit of purple as accent. As always, Jordan’s work is meticulously beautiful. Caralie chose a less stretchy fabric for a more fitted look. She also used only 6 decorative front buttons. Marisa chose to omit the decorative buttons and epaulets. Her colorful inner/lining fabric draws all the attention. Here’s a detailed shot of Elsa’s Jacqueline Hoodie. I love the yellow and grey combination. I love Donna’s combination of purple and grey on her Jacqueline Hoodie. Rachel used a light-weight fabric and created a looser fit. Look at her great job matching the stripes! Really liked the turquoise one with only 6 buttons. I think the less buttons gives it a sleeker look. I appreciate the sliding bust scale. Fantastic!! I am off to purchase this now! They are so beautiful – love all the different fabric choices! And may I add that the photos are incredible – especially love the ones of you, Kennis, but all of them are exceptional – congratulations!